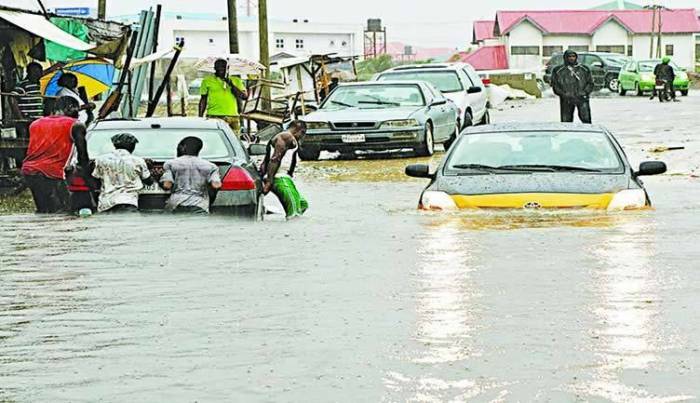 Floods caused by heavy rain over the weekend in Nigeria's northwest Kastina have claimed 44 lives, left 20 local people missing, the state governor said on Monday, Xinhua reported. More than 500 houses were destroyed while thousands of people rendered homeless, Aminu Masari, the governor of Katsina, told reporters. He spoke after inspecting the affected areas in Jibia local government area of the state. "The water from the river moved in a reverse order and come back to the town and caused the flooding," he said. The governor said the government had already relocated the victims to a primary school in the area. According to him, he had informed the Federal Government about the disaster stressing that relief agency had already brought 13 trucks loaded with relief materials for distribution to the victims. Meanwhile, President Muhammadu Buhari has expressed sadness and concern over the unprecedented devastation caused by floods in Katsina state and other parts of the country. In a statement reaching Xinhua in Lagos, Nigeria's economic hub, the Nigerian leader directed the National Emergency Management Agency (NEMA) to do everything that would bring succor to the victims. More than 40 persons were reportedly killed and 200 houses were destroyed by the recent flood in Katsina state.